Hello you lovely summer lovin’ readers. Sure do love the Forth of July. Good times to be had, my friends. Sure hope you have some great plans in the works! would be a nice addition to your celebrations! It is all dressed up in the appropriate colors after all. along with a firecracker of a dessert. 1. Pour 2 C boiling water over the top of both packages of berry blue jello. Stir it around with a spoon until all the little granules have dissolved. 2. Add once cup crushed ice to the mixture. Stir it around until all the ice melts. 3. Spray a bundt pan generously with cooking spray. 4. 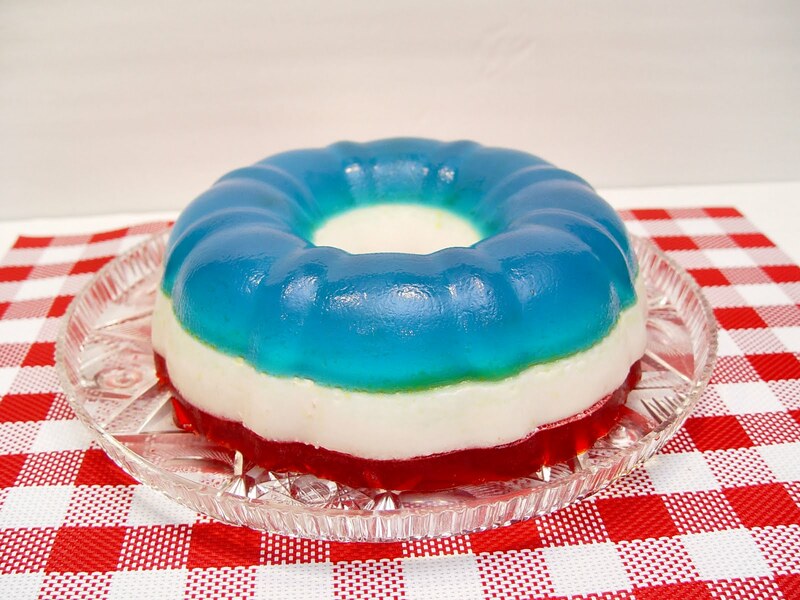 Pour the berry blue jello into the bundt and place it in your freezer for about 20 minutes or until the jello is set. 5. Combine the 2 packages unflavored gelatin with 1/2 C cold water. Stir it well to combine. Let it sit for about 5 minutes until thickened. and the set gelatin. Stir well to combine. 7. Remove the sauce pan from the heat and stir in 2 C sour cream and 2 t vanilla. Stir well to combine. Let the mixture come to room temperature. You can pop it into the fridge to hurry the cooling process. Just don’t leave it in so long that is starts to set up. 8. Take your bundt pan out of the fridge. Test the jello to be sure it is set. 9. Using a large spoon carefully pour the cooled white mixture onto the berry blue jello. Return the pan to the freezer for the white layer to set. It should only take about 20 minutes. 10. Pour 2 C boiling water into both packages of raspberry jello. Stir it well until all the jello has dissolved. 11. Pour 1 C crushed ice into the mixture. Stir until the ice has melted. 12. When the white layer has set up carefully pour the raspberry jello over the top. Cover the pan and chill for at least 3 hours, or better yet leave the old girl in the fridge overnight. 13. Take a large plate or serving tray and lay it bottom side up over the top of your bundt pan. Invert the pan. This is so cute! I think I'll be showing this puppy off on the 4th of July. Thanks for sharing! 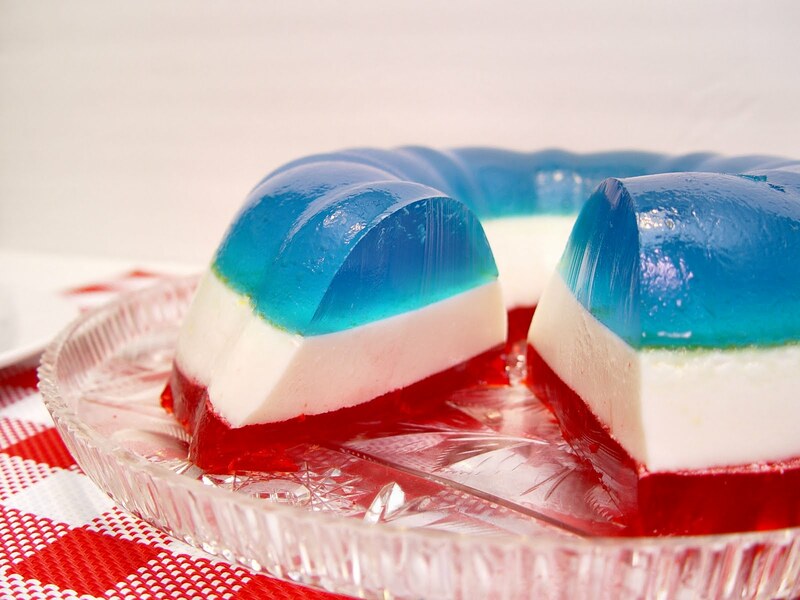 this looks awesome and who doesn't love jello in the summer?! Oh I think this looks fun! Pretty and very patriotic Jamie. The perfect dessert for the 4th. It's so funny how so many U.S. bloggers forget that some holidays are delimited to just one country, so not all of the readers may celebrate the Fourth of July, for example. 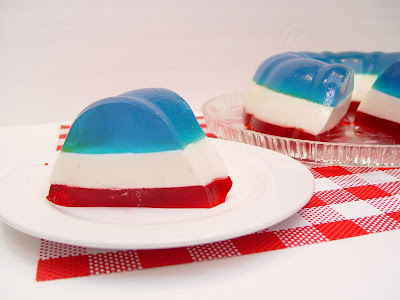 Nevertheless, I'm sure people all around the world could find a way to make a layered Jell-o (if the Jell-o is available) dish of different colors for any future occasions. It looks lovely! We just made this yesterday for a party with family today. It was quite easy! I'm just worried about getting the Jello out in 1 piece. Any tips? ?